And the concept of a high-quality print includes not only clearness, accurate colour rendering and high contrast of printings. This is a guarantee of a stable and continuous work of a device as well. Ink for ink-jet printing from INKSYSTEM company provides high-quality print. In this section ink that goes with printing devices from many different manufacturers is presented. Here you can find Canon photo ink or pigment ink , which is 100% compatible with printers of this trademark, ink for EPSON вЂ“ one of the most popular and reliable manufacturers, as well as ink for HP. All production is manufactured on a modern chemical plant in South Korea. While manufacturing of cartridge ink the latest technological achievements are being used. Thanks to that, the quality of printings, made with the help of ink for CANON from INKSYSTEM is nearly the same as the quality of photos and text documents, printed with original cartridges. You may buy ink for a printer right here, in our online-store. Are you a professional photographer or are you just fond of taking pictures of pleasant moments of life, close people or nature? Then, most likely, you have to print photos from time to time. Photo ink for ink-jet printing copes with this just perfectly. INKSYSTEM company produces high-quality and affordable photo ink for EPSON as well as for inkjets and MFP of other manufacturers. Production presented lets get bright, rich photos with subtle colour gradation. Photo ink for HP, CANON and EPSON is a water-soluble ink. The dye in photo ink for color cartridges represents liquid, which is mixed with solvent. There are no any hard-grained fractions in this type of dye. Thanks to this peculiarity, photo ink for CANON lets print photos full of bright, rich colours and with impressive gradations in color. So, if you are going to work with photos and coloured images, choose photo ink for EPSON or photo ink for HP and photo paper. Water-soluble ink is not very expensive, that's why many users can afford colourful and vivid photos. Unlike photo ink for ink-jet printing, pigmental ink for cartridges contains a number of hard-grained fractions вЂ“ pigment. Pigment consists of the smallest grains of dye. To get pigmental ink for EPSON, dye is powdered into grains of size less than 0.1 micrometer. Though the diameter of pigments is very small, the grains have the features of a rigid body. This peculiarity lets get high-quality text documents with the help of pigmental ink. It is well-known that laser printers, as well as printers with CISS cope with text printing perfectly. Pigmental ink for HP provides the quality of printings, comparable with "laser" quality. Moreover, pigmental ink for EPSON printers provides longevity of all the printed materials. 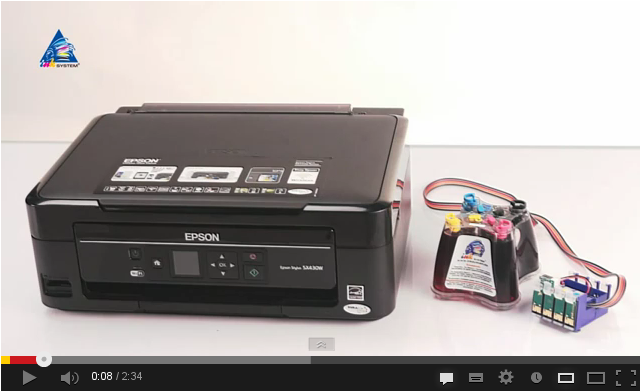 So, you may buy ink for EPSON and print important documents and contracts without problems. Sublimation ink for CANON is intended for high-quality printing on thermo film. With the help of this ink bright, colourful souvenirs are created. Sublimation ink for HP cartridges let print unique images on clothes or plates, cups and dishes. T-shirts with their owners' photos imprinted, individual tea cups, baseball caps, wine glasses вЂ“ all these things are usually made with the help of sublimation ink for EPSON. Such prints are very bright and colourful, that's why many people buy these souvenirs in order to present them to close friends. Gifts, created with the help of high-quality sublimation ink for CANON cartridges, give festive mood. The formula of such type of ink give prints not only brilliance and bright colours, but an exceptional durability as well. That's why you may buy sublimation ink for a print on items of everyday use. Such imprints are long- lasting; they don't stratify, crack or rub away. You may buy sublimation ink for HP or any ink-jet printing device of another manufacturer, just making an order on our site. For outdoor advertising eco-solvent ink for ink-jet print is used. This ink contains a minimal amount of solvent. Thanks to that, all the printings, created with the help of eco-solvent ink for CANON has an exceptional coloration. The uniqueness of this sort of ink is that with its help one may render much more colors, while all the shades are very rich. Moreover, eco-solvent ink for HP has the highest rate of adhesion, that is, cohesion with the material. Thanks to that, you may use this kind of dye for any carriers imaginable. Besides, ink for EPSON, intended for outdoor advertising, just ought to give durability to imprints. And eco-solvent ink for CANON really provides durability and firmness to external influences. Besides outdoor advertising, this sort of ink can be used for interior design needs. On our site every user can find ink for HP or an inkjet of another trademark that will comply with his own needs. Amateur photographers or home users will choose water-soluble ink for CANON. Businessmen, as well as those people who like to make surprises, may order sublimation ink for the creation of unique souvenirs. Office users and the owners of four-color printing devices will probably fix upon pigmental ink for HP. 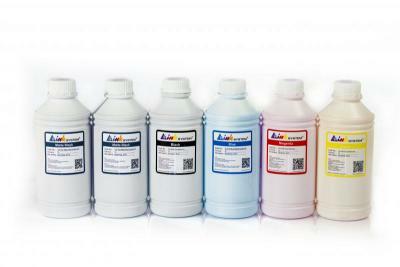 To professional photographers INKSYSTEM offers ultra-chrome dye. 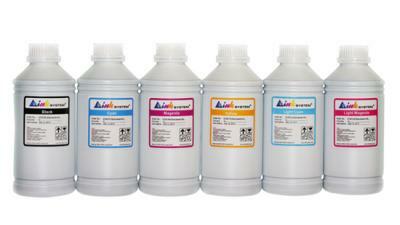 Eco-solvent ink for EPSON, in its turn, will suit to advertising agencies and photo labs. In our catalogue one can find even an invisible dye, created specially for the documents of particular importance. 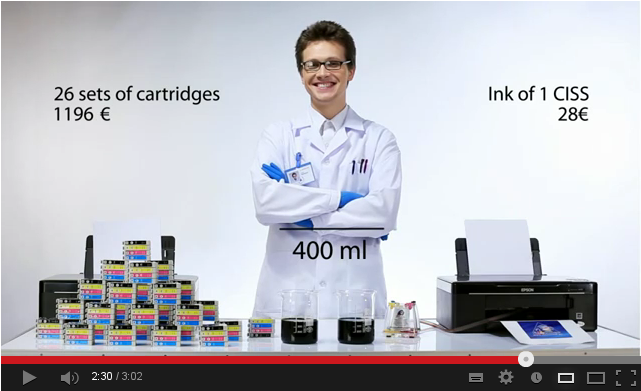 Each type of ink for HP printer has its own formula and its own purpose. You are just to choose a necessary article. High-quality ink for cartridges (or original cartridges) lets printing devices work long and fail-safely. The ink, presented in this section, keeps the operability of a printer or MFP. You may buy ink for a printer, and a special formula of dye won't let a printing head get dried, even if the device will lie idle for about three months. In this section one can choose and purchase ink for CANON, ink for EPSON and ink for HP. Presented here ink is perfectly compatible with printing devices. A wide assortment of ink for an ink-jet printing lets choose the type of ink, which will suit perfectly for a printing device and different tasks of printing. Here you can also find sets of ink for CANON, consisting of six colors, for high-quality photo print, or ink for EPSON, which is presented in four colors for inexpensive models of printers. You may choose jars of suitable size and packaging arrangement. Moreover, you may purchase many colours separately. One may buy ink for a printer or plotter with the help of our site, as well as at regional dealers of the company. Qualitative printing can be reached in case quality ink is used. 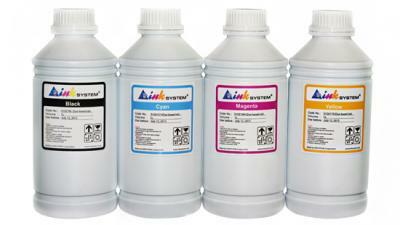 This section offers you any dyestuff for an inkjet printer that will meet any printing needs. We've got a wide choice of ink for such brands as EPSON, CANON and HP. You just choose and enjoy fine results. Want to print a plenty of photos? Our catalogue contains water-solvent ink for color EPSON cartridges specially for you. High quality of printed photos and color images will be provided by photo ink. Thus water-solvent ink for Epson cartridges is a perfect decision for drawing details and subtle color gradations as well as providing bright and rich colors of images. And if you are interested in printing of text documents above all, look at Florida printer pigment ink. With the help of pigment ink for Epson cartridges your reports, contracts and charts will be shipshape and qualitative. For those who need to create souvenirs there is a sublimation ink for Brother printers. It will let you have the photos with saturated colors, great longevity and sustainability against exterior influence. Pigment Ultra ink for Epson 9890, Canon, HP will be useful for professionals who aim at getting genuine photo masterpieces. The advantage of this ink also lies in its being eco-solvent, which enables both outdoor advertising creation and fulfilling interior design needs. Omnifarious posters, desk calendars, photo wallpaper with deep rich colors вЂ“ everything is possible with such dye. Moreover this type of ink is suitable for any carriers and guarantees you decent quality and durability. One more special product present in our catalogue is invisible printer ink. Owing to it you are always able to protect confidential information. In this way printings can be seen only when heated or intensified with ultra violet, or influenced by some chemical reagents. It's notable that all the ink for Epson, Canon, HP mentioned above are qualitative and rather inexpensive. The prices are quite acceptable for many users to afford cheap and high-quality printing, though of course lower prices can be found in the internet. So purchase ink through INKSYSTEN commerce and get neat beautiful printings together with significant economy. Pay attention that Original cartridges New York are available here too. It is possible to buy special ink for cartridges by CANON in standard-capacity containers (for MFPs and printers) or to get ink for CANON plotters and Canon Photo ink Bangor too. The capacity of jars for the latter ones is enlarged. Our online store takes care of your budget and keeps his eye open for the best quality. Here you always can enjoy attractive prices and be sure of an excellent print quality you've paid for, buying photo background paper or ink commerce in Chicago.